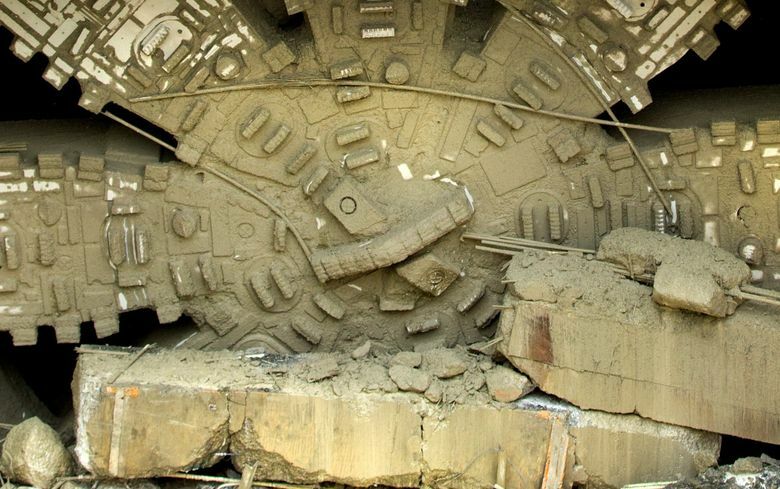 The Port of Seattle claimed two historic pieces of tunnel-boring machine Bertha, and could give them to another group or display them at its own parks. The Port of Seattle came to the rescue Friday morning in efforts to preserve retired tunnel-boring machine Bertha by taking a 20-ton cutter fragment to its Terminal 5 for safekeeping. Next week the Port will salvage a 10-ton center piece, nicknamed the “fishtail.” This is a triangle whose sharp point was first to contact dirt, as the giant drill advanced 1.7 miles from 2013 to 2017. Most of the 630-ton, disc-shaped cutter, plus the front-end drive parts, will still be scrapped — with steel pieces to be recycled at Nucor Steel in West Seattle. Friday’s rusty endpiece, part of a 27-foot-long spoke in the cutterhead, measures 9 feet by 5 feet by 5 feet. Project leaders from Hitachi Zosen, which built Bertha in Japan, watched and posed for pictures while a crew from the Omega Morgan heavy-lift company lowered it onto the Port’s flatbed truck, at the north Highway 99 tunnel portal near the Space Needle. “We are very free to donate pieces of the TBM so that future generations will know the machine that accomplished this historic project,” said Shinji Ogaki, Hitachi Zosen’s project manager. The triangular fishtail, also known as the center cone, will be removed from Bertha by cutting torches and will be 1.5 meters long, he said. The fate of memorabilia isn’t certain but came into sharper focus Friday morning. • The Port doesn’t know yet where its two pieces will go permanently, spokesman Perry Cooper said. It does have options, on its own land or someplace else. The Port’s maritime-themed Jack Block Park sits next to Terminal 5 in West Seattle, and parts of old gears and valves have been displayed for years on Harbor Island. “We haven’t determined that yet, but we’re going to find a great place for it to be viewed by the public,” Cooper said of Bertha. • The Museum of History & Industry wants at least one of the smaller 75-pound cutting teeth and a control panel that operators used to steer Bertha, Ogaki said. Negotiations are still in progress. • Seattle Iron & Metals, in the Duwamish area, continues to carve spoke lengths into even smaller pieces for recycling, but still has “certainly a half-dozen or more” 20-ton pieces available, said Adam Thomas, a steel buyer there. “We have been fielding requests for pieces from both the private sector and government agencies,“ he said Friday. • The Seattle Art Museum, which owns Olympic Sculpture Park, has not solicited tunnel-machine components. • Hitachi Zosen plans to reuse a giant onboard power generator and a rotating conveyor screw. The drill’s circular main bearing, some 10 meters in diameter, will be carved apart by Seattle Tunnel Partners because it’s too big to remove whole, but Ogaki said he’ll donate that if someone here claims it. Though a crescent-shaped replica sits as a monument in Tokyo Bay, the company doesn’t have a history of leaving cutting remnants behind. Hitachi Zosen is offering Bertha’s leftover pieces at no charge, but users must pay for transportation, land and maintenance. The Port itself is a tunnel participant, by providing $267 million and a loading dock for barges that removed Bertha’s muck to a quarry across Puget Sound. Total costs are $2.1 billion for the tunnel, or $3.1 billion with adjoining ramps, overpasses and streets. Overruns of up to a half-billion dollars, for delays and tunnel-machine repairs, are still under dispute. At a diameter of 57 feet, 4 inches, Bertha was the world’s largest tunnel drill when it departed its launch pit in Sodo on July 30, 2013. A slightly wider machine dug a portion of a tunneled highway to Hong Kong’s airport in 2015. The four-lane, tolled Highway 99 tunnel bypassing downtown, to replace the Alaskan Way Viaduct, is expected to open by early 2019.